It’s getting down to the business end of the World Series of Poker Europe Main Event at the Hôtel Majestic Barrière in Cannes, France, with just 115 of the 593 starters still in the hunt for a slice of the massive €5,692,800. Four Aussies remain in contention for one of the 64 spots in the money in the €10,400 buy-in Main Event, led by Sydneysider Joel Dodds. In a stunning end to the day, WSOP.com reported that Dodds was all-in pre-flop with K-Q against the A-K of Mustapha Kanit. A Q in the window put Dodds ahead but the flop flowed J-10 to give Kanit a straight. Incredibly, the board ran out 10 (turn) and 10 (river) to make Dodds a full-house. We understand he was already on his way out of the tournament area and needed to be called back to the tournament area to bag up his stack of 270,000, good for 13th overall. Other Aussies who’ll be back for day 3 are APPT Melbourne champion Leo Boxell (38th, 183,900), Michael Pedley (56th, 145,800) and Tony G (59th, 135,400). 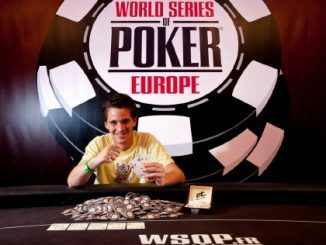 The chip leader in this star-studded field is 2009 EPT San Remo champion Constant Rijkenberg of the Netherlands on 462,800, with Hoyt Corkins (125th in the same event last year) close behind on 429,900. Erik Seidel’s stunning year continues, as he lies ninth in chips.